How does Ms. Horwitz help students prepare for the evidence-based discussion? How does Ms. Horwitz ensure for equity of voice during the discussion? What strategies does Ms. Horwitz use to support her students during the academic discussion, especially her ELL students? I love that the students were given participation chips so that the teacher could see which students had already participated and who still needed to participate. I think that this creates an equitable classroom where every voice is valued and discussions are not dominated by certain students. 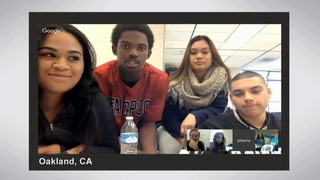 This is a wonderful example of a student-centered activity where all students were encouraged to participate. I also loved the use of the sentence frames on the wall behind the teacher. They are helpful for those students who may have difficulty finding the words to explain their ideas. Before the discussion the students were allowed some prep time to write down their ideas and evidence that supported their opinions on the topic at hand. When done the teacher brought all the students in to a group discussion formed in a circle so everyone was able to see each other could feel. They weren't allowed to bring pencils so their attention is focused on the speaker. This was a good way to develop listening and speaking skills with the students. Thank you! 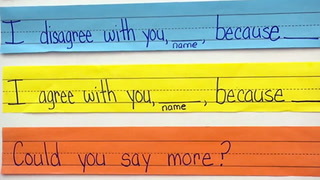 Is there a way to send the yellow sheets and sentence frames to use in our classrooms for academic discussions? Do you have the template for the yellow sheet? It was great to see the way that she made sure that all students were accountable to participate in the discussion. 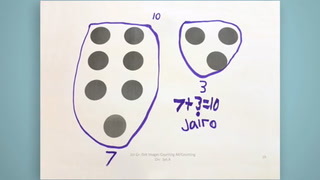 She also made sure on their yellow sheets and in the discussion that the continued on to make their own connections and stretched their thinking. This really does have to begin early and often, so students don't get to the college level and then don't know how to think independently. Sarah Horwitz: Good morning, fourth graders! Class: Good morning, Miss Horwitz. Sarah Horwitz: My name is Sarah Horwitz, I teach fourth grade at Acorn Woodland Elementary School, which is a public school in East Oakland. Sarah Horwitz: We have been doing amazing work, learning about different environmental issues that are serious problems, but also, we've been learning that there are many ways that we can solve these problems. Sarah Horwitz: Today's lesson was Day 2 of a project that will last three weeks. Each student has been assigned or has voted to join one of six research groups, which will become expert in one of six environmental topics. And the six topics are, Global Climate Change, Oil Spills, The California Drought, Environmental Health, Clean Energy versus Dirty Energy, and Endangered Animals. Sarah Horwitz: And today, what we're going to be doing is doing our best to convince each other that our environmental issue is the most important one! Sarah Horwitz: They were coming from the library, where they had had about 40 minutes to do research online using notecards of problem, solutions and background information related to these topics. Sarah Horwitz: And so we're going to begin with just two minutes of time, in which you're going to be able to discuss and plan with your team, listen carefully to one another. 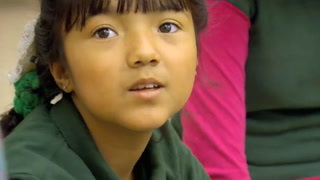 Student: For example, when we took the trip to Lake Merritt, we cleaned up the trash. Student: It can cause a lot of damage for some animals, and it can cause a big explosion. Student: -- thought that it was food, and it ate the trash and then the animal ended up dying. Sarah Horwitz: Finish up with your sharing! Student: If we ran out of water, where can the fishes live? Sarah Horwitz: Hey, hey, fourth graders! Class: Hey, hey, Miss Horwitz! Sarah Horwitz: We are now going to have five minutes to plan. Sarah Horwitz: I gave them kind of an entry ticket on which they needed to put, "What is my topic?" and then they needed to make the claim that, "This is the most important environmental issue." Sarah Horwitz: You may look at your notecards. Think about using cause and effect language, think about a specific example. Sarah Horwitz: And then they needed to come up with at least two pieces of evidence why, or examples of that problem. Sarah Horwitz: You are going to be able to bring your notes with you to the rug, but you cannot bring a pencil, because I want to make sure that while other students are speaking, your eyes are on the speaker. Sarah Horwitz: I brought them to the rug and as much as possible, I want students to feel that they're in the driver's seat of being responsible. I had them using participation chips, so that at least I could monitor, but they could also see, "Okay, there's one person who has their hand up who hasn't shared yet." I want to pass to that person who hasn't shared yet. A big goal for me was for students to be able to do those three things that were listed on the checklist. So can you contribute a claim and provide evidence? Sarah Horwitz: Can you build on somebody else's idea? Can you ask a question that shows that you're interacting and thinking and evaluating what's going on? Sarah Horwitz: And also allowing your own curiosity to be present in the room? That's something that is a lovely part of what academic discussion should look like. Sarah Horwitz: In this discussion, we may go back and forth between different issues, but as somebody starts to share, you want to think, "Do I have information I can add on? Do I want to agree? Do I want to disagree?" Remember to use evidence. Our Elaboration Emperor and Empress are listening carefully to make sure that you do. Sarah Horwitz: So instead of saying, "Well, can you tell me more about that?" Or, "Well, that's not clear," myself, it's been a new practice for me to use Elaboration Emperor and Empresses to fill that role. Sarah Horwitz: Jose, go ahead and start us off. Jose: I think oil spills can be harmful because if it falls in the water, it could harm animals. Student: Can you explain more? Jose: And the animals can get killed. Student: I want to add onto Jose, because if oil falls down through the water, the animals can get really, really sick. They can like drink the water, and so they'll be drinking the oil. Student: Do you have another example? Student: One example is the problem in the Gulf of Mexico. Sarah Horwitz: In terms of the Common Core, in all the content areas, providing evidence is at the foundation of what is required. Student: There was a ship that spilled some oil and it blew up. The animals were really harmed. Jasmine. Jasmine: I have something new to share. In my opinion, environmental health is the most important. Two examples of this is sugar can give you diabetes, for example, Type 2 diabetes. And at this rate, in 50 years, one out of three Americans will suffer from this debilitating disease. So one solution to this would be, be more careful of, and manage, how much candy you can have a day. Student: So, Jasimine, are you saying that if people eat too much sugar or something like that, they can get diabetes? Student: I have a question. How is all of this environmental? Sarah Horwitz: I have another question that might help answer that question. Do you guys think that everywhere, people have the same diet? Do all kinds of people have the same diet? Sarah Horwitz: Or is it something to do with your environment? Sarah Horwitz: That might impact your diet? Sarah Horwitz: I haven't completely withdrawn from academic discussion to the point where my voice is completely outside of the circle. At some point, I want to try that, and I imagine that that would be very challenging for me. Sarah Horwitz: When you look around, try and call on a person who hasn't yet been called on. Thank you. Axel. Sarah Horwitz: The trade-off is that kids love to have a sense of leadership. Kids have many capacities, and if my goal as an educator is to build my students' capacities, then my favorite moments as a teacher, my moments of greatest success are when I'm able to step back and they carry the process. Student: I agree with you, because you can also get diabetes with sugar, but also you can also get diabetes by the more fast food or junk food that you eat. Student: I agree with Damien and Jasmine, like my grandpa got diabetes 'cause he was eating junk food. But now he got rid of it, 'cause he started eating healthy. Sarah Horwitz: Students were making connections that they've never made before. And what's distinct is to have those personal discussions also be academic discussions at the same time. Which, to me, is a huge success. Sarah Horwitz: There are still some students who have not shared. If you have not shared anything in our discussion, I am now inviting you to come into the center of the circle. Sarah Horwitz: At the end of the discussion, I asked all of the students who hadn't shared yet at all, to come into the middle and at least share something that they had learned, or something that they found that was important, or something that was somehow relevant to the topic that we were covering. If the expectation is that everyone shares, the scaffold is, everyone shares, but the kids who are more hesitant can wait till the end. Student: Something that important is to not waste water. Student: Something important today that I learned is that never eat too much fast food, if not, you will get diabetes. Student: Something that's important is not eat a lot of candy. Sarah Horwitz: At the end of the activity, what I wanted to see was whether or not they were really engaging in the discussion as an opportunity to stretch their thinking, to allow themselves to have their minds changed, to build on their own ideas. Sarah Horwitz: It is time for us to do the very last portion of our academic discussion work, which is filling out the bottom section of our Reflection. Being able to learn from one another is part of our standards, is part of what we're working on. Sarah Horwitz: I feel that it's important for me to be teaching students not just to know information, but to have the skill of how to convince others, because that's what makes the world different, and I don't believe that the world we have now is the one that our kids deserve, and so it's going to be up to them to help convince others to make the changes that are going to be necessary in order to make a more just and a more sustainable world.